Here are some of our photos from BourneFree - Bournemouth Pride 14th July 2018, More can be seen on the links below, and check out the You Tube links also below of the parade. Charity interviews people attending Pride, and some of the many lgbt organisations that had stalls there. * The Parade was the longest and best ever! * The party in The triangle had to stop admitting people as it had reached full capacity for the first time ever! Many thanks to all the volunteers at Bournefree who help to make this event happen every year. Bournemouth Pride - Bourne Free is normally on the second Saturday of July each year. 13th July 2019 tbc. Save the date now, and check back here in early 2019 for confirmation of date. In 2017 Bournemouth Pride was on the first Saturday in July. A PARTY atmosphere filled Bournemouth town centre this weekend as Bourne Free was celebrated. The annual Pride parade took place on Saturday, filling the streets with a dazzling display of rainbow colours. The roadsides were packed with people watching the procession, which celebrated the diverse LGBTQ+ community. A wide array of organisations, charities, groups, and individuals took part including Dorset and Wiltshire Fire and Rescue Service, Dorset Police, and South Western Ambulance Service, all of which decorated their vehicles in rainbow colours specially for the event. Rubyz, Space Youth Project, Communi-T, Yellow Buses and Morebus also had floats in the parade. The celebrations continued after the parade, with free family entertainment and stalls in the Lower Gardens until 4.30pm, and live music and entertainment for over 18s in the Triangle. Acts including Dane Bowers, MC Big Ben, S Club, Artful Dodger, Brandon Block, Michelle Heaton, Courtney Act, and Sam Callahan performed. and ... from The Gay UK Magazine .... some of our friends are shown here! Did you miss the BIGGEST & BEST Dorset LGBT event of the year? Well you can join in all the fun in 2019! Bournemouth Pride - Bourne Free is normally on the second Saturday of July each year. 13th July 2019. Save the date now! Please make sure you check out all our other pages, lots of local lgbt events, local lgbt news, helplines and info on Weymouth & Portlands first Pride event in 2019 too! 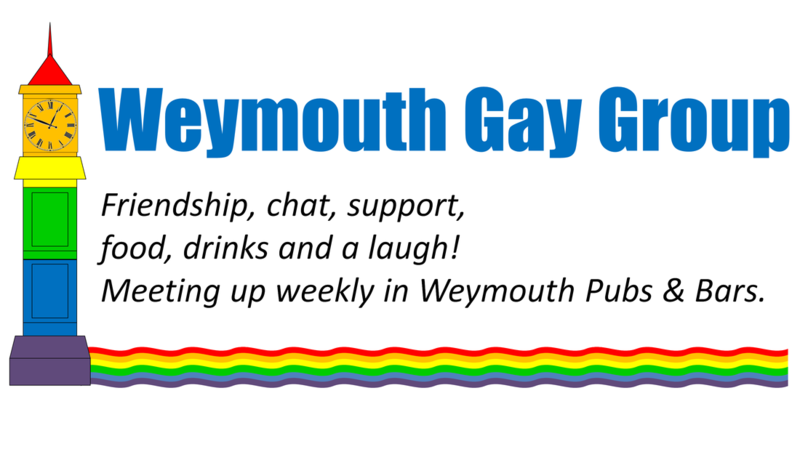 email :- weymouthgaygroup@gmail.com Twitter https://twitter.com/WeymouthGayGrp and some where on facebook too!